As the internet penetration increases in India, Discount broking has become a more and more viable business model. So, we thought of bringing a collection of some of the Best discount brokers in India: Top List that you surely need to checkout. The discount broker has a really light asset model and their model is primarily based on the number of trades as they charge a fraction of fees as compared to Full Service brokers. We shall highlight key features and brokerage charged on some of the popular discount trading platforms. You shall also get to know about various options that these online stock brokers generally support (Web, Mobile and Desktop). Discount brokers offer a trading platform to the investors but not any advisory services as such. 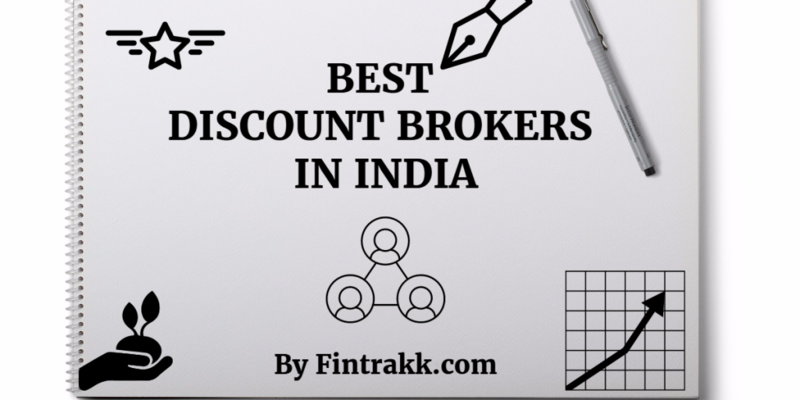 No doubt, as their name describes itself, discount brokers charge a discounted rate or a low brokerage as compared to traditional full service brokers in India. Apart from being asset light, these discount brokers focus on providing one service like stock trading really well. One might argue that Full service brokers provide many other services. However, we will keep the debate of discount broker vs full service broker for some other day. For now, let’s have a look at the best discount brokers in India. The ones who have significantly changed the landscape of brokerage models across India. Zerodha is a pioneer in the discount broking revolution. In fact, Zerodha brought up the concept of discount broking in the year 2010 in India. A first of its kind flat brokerage model! Since then, there’s indeed no looking back. This has become one of the largest and the fastest growing discount brokers in India. Hence, it was the first discount broker coming up with its fresh ideas in the broking market, thereby introducing a flat fee based trading fixed at Rs 20 per trade regardless of the volume of trade. Undoubtedly, this was a drastic change on how the brokerage was being charged. Full Service Traditional brokerages charge at %age of the volume of trade which becomes quite exorbitant if the trade size is large. Another path breaking move that Zerodha delivered in the brokerage industry was making the delivery trades free so that new investors can enter the market without barriers. The best and the most popular one. Indeed! 5Paisa is backed by financial behemoth India Infoline (IIFL). IIFL brings the stability of being a public limited company and 5paisa as a discount brokerage product offers top of line trading clients to the clients. Being a part of IIFL group, 5Paisa website offers much more than just Stock Trading. One can go for car, health and term insurance as well on the 5Paisa portal. Financial Advisory services are another plus, if you want to take advise instead of do it yourself approach. A strong contender that ranks very high in the list of discount brokers in India. This is also referred as the 2nd largest discount broker, next to Zerodha. 5Paisa follows a flat and simple brokerage structure. You are charged flat Rs.10 for each executed trade in equity segment (Delivery, Equity F&O and currency F&O). SAS online is is another great entrant in the discount brokerage space. Started by 2 young entrepreneurs, SAS Online aims to be the true discount broker and breaks the barrier of trading even lower. It supports Equity, commodity(MCX) and currency Trading. The trading platform offers the choice of desktop, mobile and web versions to chose from to setup your trade. SASOnline offers one of the most competitive brokerage and charges only Rs.9 per trade across all the segments. But, if you are a heavier trader and trade more frequently then you can buy lumpsum plans or Rs.499 or Rs.999 per month wherein you can do as many trades as you would like without being charged any extra fees. Freedom Plan: Trading in all segments (BSE, NSE & MCX) at zero brokerage. This offers very little margin/exposure. Pro Plan: Meant for professional traders, this plan charges brokerage in NSE equities 0.005% intraday and delivery. Brokerage in NSE futures, options and MCX is Rs.9 per trade. Ultimate Plan: Best suited to high frequency traders looking for highest margin/exposure. Brokerage in NSE equities is 0.007% Intraday & delivery. The brokerage is 0.005% NSE futures, currency & commodity trading at MCX and Rs.15/lot in options. Samco Securities provides another great online discount brokerage product. Samco provides a whole suite of products at a discount price with highest quality. You can trade Stocks, F&Os, Commodities and Currency in the samco dashboard. Samco Supports trading on NSE, BSE, MSEI and MCX. Samco product suite offers Samco Trader for trading from desktop, Samco Mobile Trader for trading from iOS/Android platform, Samco Web as a browser based trading platform, Algorithmic trading for high frequency traders, Samco Star for back office management. Samco also supports call and trade but the call and trade facility is separately chargeable just like other discount brokers. Samco Charges a flat fee of Rs.20 per trade of 0.02% whichever is lower across all the segments and exchanges. That’s it!! No hidden cost. Upstox is another popular discount brokerage firm. The firm got a lot of fame after being backed by kalaari capital and Ratan Tata. Not to say that this is the only traction they have got. Upstox has built a truely paperless demat account opening and trading platform. One can trade Intraday/commodity/F&O/Currencies on the upstox platform. Their mutual funds platform is also the one to have a look at. The platform is available on web, desktop and mobile alike. Just like the other discount brokerages, upstox charges a flat Rs.20 per trade. No frills attached ! Another low brokerage offering discount broker in India. Trade Smart Online, a venture of VNS Finance has also become a key player in the discount trading business. Similar to few other discount brokers, this also offers different brokerage plans for low and high volume traders. Value Trading Plan: Brokerage for Intraday Cash, Futures, Currency, Commodities is 0.007% and delivery is 0.07% For Options Rs. 7 per lot. Suitable for low volume traders. Power Trading Plan: Rs.15 per trade irrespective of executed trade. Suitable to traders with less frequency but big volume. Prostocks is a fast growing discount brokerage firm. The founders are really experienced in the brokerage business and committed to providing great service. You can trade Equity (Delivery, intraday, F&O) and currencies on the platform. The platform offers desktop trading tool, a mobile trading application and prostocks web trading application. As of writing this post, prostocks is giving out a free account opening offer. Prostocks charges flat Rs.15 per trade. It offers a monthly and yearly packages as well for unlimited trading but they are mainly suited if you are a high frequency trader doing several trades in a month. ALSO READ Fixed Deposit vs Mutual Funds: Which is better investment option? Tradingbells is new generation discount broking firm. You can trade Equity (Delivery, intraday, F&O), currencies and commodities on the platform. The platform offers desktop trading tool, a mobile trading application and a web trading application. The platform supports 15 minute account opening if you have an aadhar card. The current era is one of the golden period in trading industry. All the above discount brokerage platforms are great products. These are really moving the trading community a big step forward. There would be some minor differences between each of them. Look for you priorities and usage and chose the one which suits your needs well. Each of the brokerages provides different leverage on different segments. Please check that out before opening an account with any of the discount brokers. The charges are on “as is” basis, as applicable while writing this post. Please check the latest brokerage on the website before opening an account with any of the discount brokers in India. Most of the brokers provide demat account at the time of opening. Different Account opening charges may apply on each of them. Taxes shall be added to the total cost wherever applicable. Various Govt and SEBI levies will also apply as per the rules. Disclaimer : There is a high degree of risk involved in stock trading. The details given on this website are for informational purpose and cannot be constituted as professional advice in any regard. Please follow due diligence and do your own research before opening a demat and trading account with any of the stock brokers. Have you opened an account with any of the Best Discount Brokers in India? Do share your experiences on the same in the comment section below. Your valuable feedback shall help our readers get deeper insights and act wisely by taking the correct financial decisions. ICICI direct is also a good brokerage.Their name should also be included. This is list of Discount brokers – ICICI direct is full service broker. 5paisa(IIFL) offers the best fee structure. Also IIFL is a listed company and best known in the market. Go For 5Paisa. Discount brokers are a good choice for people with DIY approach.A lot of emerging brokers have eased out the process for investors and traders. What are your thoughts on Tradejini? Is it good broker? Any feedback. « How to Pay off Student Loans Faster? Easy Steps to follow!